The "engine room" is often referred to as one of the most important parts of a football team, as the midfield is where the battle is often won on the football field. This weekend South Adelaide supporters will notice a significant boost in engine power around the ground, as the Leukaemia Foundation's 'Aussie Muscle Car Run' cars make their way to Noarlunga for the Panthers "Old Skool Round". The AMCR is one of the Leukaemia Foundation's iconic fundraising events, which showcases the classic cars of the 60s and 70s in all their glory. The Leukaemia Foundation are entering their second year as Major Charity Partners with the Panthers and the AMCR cause holds an extra special link with skipper Brad Crabb. Brad's father John and twin brother Darran have been participants in the event since 2012, having raised over $20,000 for the Leukaemia Foundation in that time. "It means a lot to me that South has chosen the Leukaemia Foundation as its charity partner my family holds this cause close to our hearts," explains Crabb, who is entering his second season at the helm at Hickinbotham Oval, continuing a career with South that began with its junior talent identification programs. "Dad has been a terrific support to me over my footy career and he is just as passionate about his cars and fundraising for the Leukaemia Foundation. "Both my brother Darran and Dad will be at the game showing off their hotted up Holdens should be a great day". South Adelaide's involvement with the Leukaemia Foundation began in 2015 with the joint community initiative of delivering free services to cancer patients in the Southern districts. This was so well received that attendance to the patient education seminars held monthly at Hickinbotham Oval doubled by the end of the year. SAFC Captain Brad Crabb proudly shaved his head in front of his team mates and South faithful, together with team mate Tom Fields who coloured his hair bright blue! Joining them in the effort to raise much needed funds were Tony Bamford - SAFC's Talent Manager, Marc Holford - Liquid Engineer, Jimmy Wilson - Volunteer, Troy Harris - Sales Manager at Joint Major Partner Grand Nissan and Under 18s player Ryan Jeffries. Together the brave team of six raised over $6,000 towards the Leukaemia Foundation's Vision to Cure and Mission to Care. For now attention turns to Old Skool Round, where South supporters can enjoy a look at the AMCR cars on display around the ground, groove to retro cover band No 2 Ways, see a disco inspired cheerleaders performance as well as plenty of fun activities for families on the day. 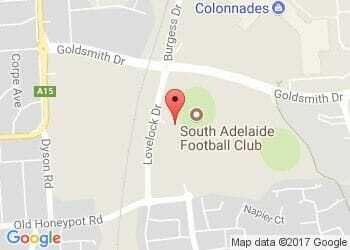 And hopefully the Panthers roar as loud as their souped-up engines as they tackle reigning Premiers West Adelaide!